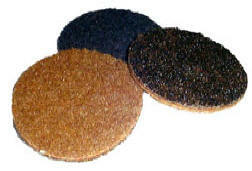 These hook & loop backed nonwoven nylon surface conditioning discs are excellent for removing burs, rust, and corrosion from metal surfaces. They will clean old metal and make it look new. Used industrially to polish welded joints. 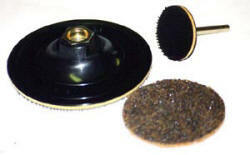 The SCD discs on this page are scrim back for use with our Gripper style hook & loop backup pads. These pads have a 5/8-11 arbor for use with right angle grinders, or a 1/4" spindle for the smaller diameters.